How to switch the editor in mc (midnight commander) from nano to mcedit? F9 Activates the top menu. o Selects the Option menu. 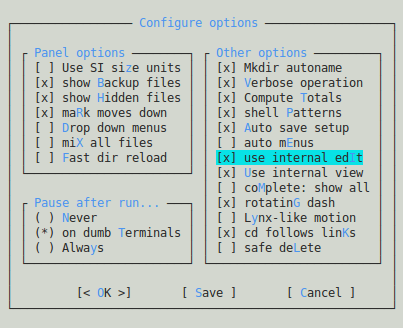 c Opens the configuration dialog. i Toggles the use internal edit option. Run MC as usual. On the command line right above the bottom row of menu selections type select-editor. This should open a menu with a list of all of your installed editors. This is working for me on all my current Linux machines. You will get an list of the installed Editors in your Ubuntu, and you can chose your favorite.